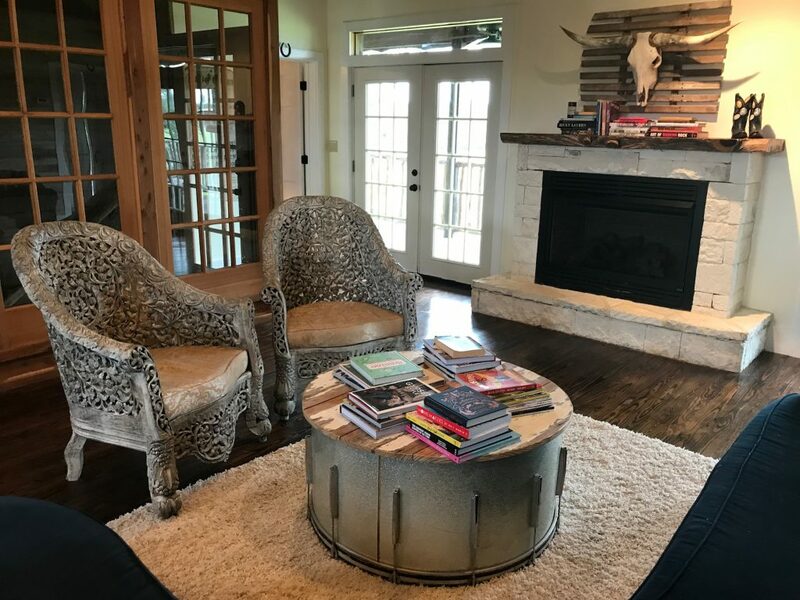 A few months back, some home decor blogger friends and I embarked on the ultimate girls road trip to the Junk Gypsy headquarters in Round Top, Texas to meet Aime and Jolie Sykes. 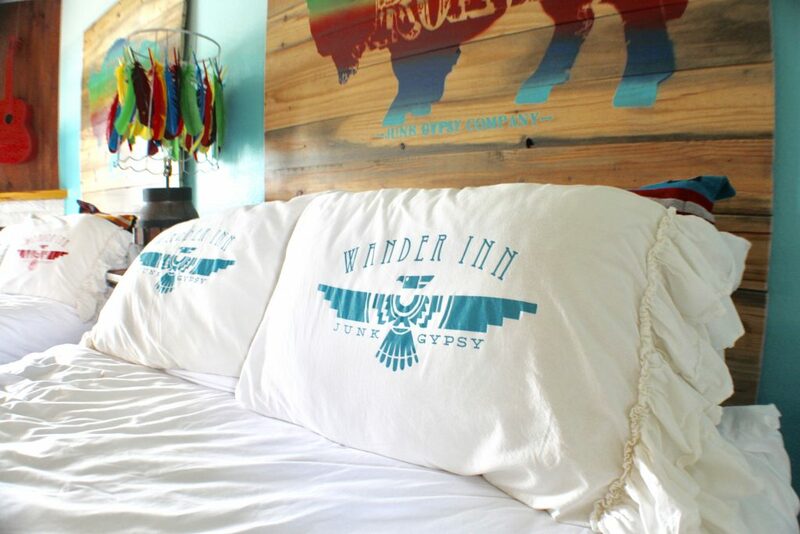 To top it off, we stayed in the Wander Inn, which officially opens this year!! Oh yes, my dreams came true when I met this tough as nails, cute as a button sister duo! 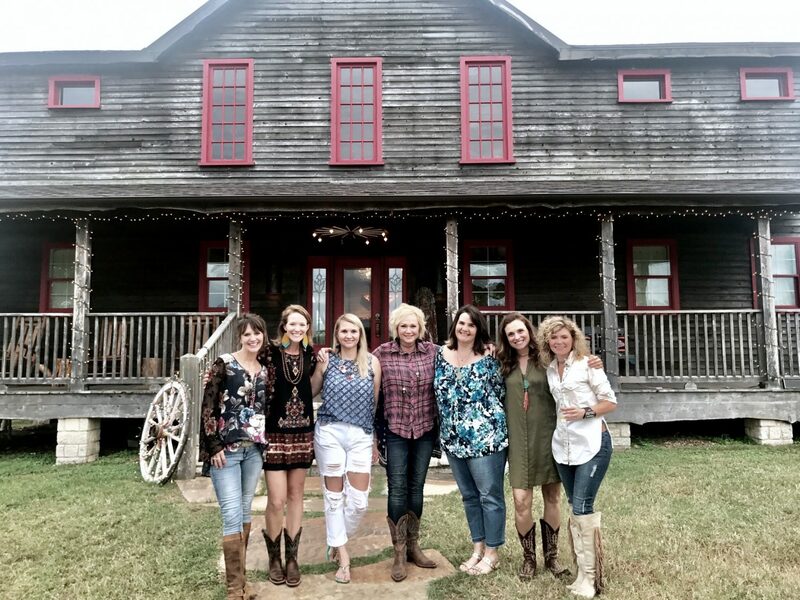 These girls are just as they appear on their tv shows from HGTV and Great American Country, Facebook video series and in magazines. It is all cowgirl boots, faded denim with a little bling mixed in! They are so down to earth, so real and so creative. When you talk with them, it seems like y’all are old friends. I want to be besties with y’all, Aime and Jolie! Amie and Jolie gave us a tour and made us feel so welcome at the Wander Inn. The inn is located right behind the Junk Gypsy store and consists of two buildings that the JG family had moved to their property a few years ago with the idea to transform it into an inn for guests! They have a knack and love for restoring old houses. 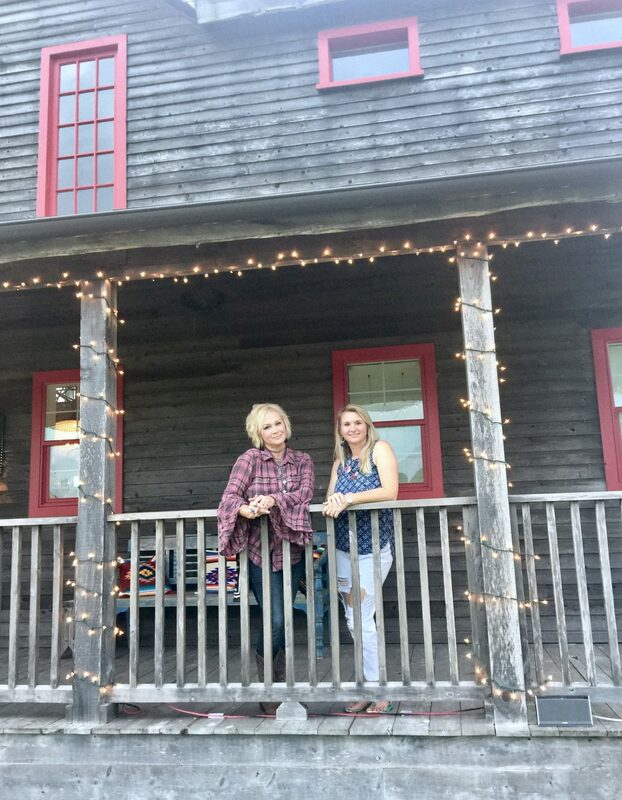 Actually, Amie’s home at the JG headquarters is a 1900’s farmhouse that was moved onto the property and lovingly transformed with salvaged architecture and funky vintage finds. You can read all about it in the Junk Gypsy book! 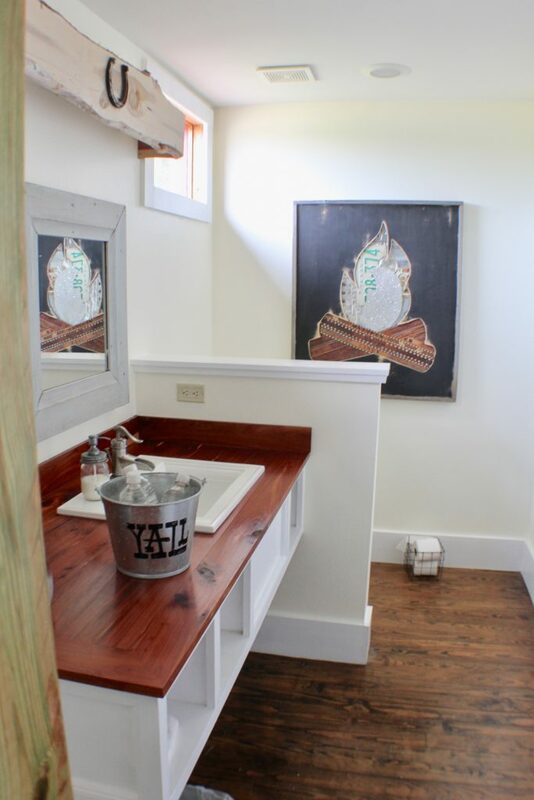 When we visited, they had just moved a small two story farmhouse onto the property to restore! I can’t wait to see what they do with it! This was my view on the back porch of the Wander Inn where the lack of internet access strongly encouraged me to put down my phone and appreciate the beauty of the rural countryside in small town America. The red barns scattered among the pastures of green grass quickly reminded me of my childhood, my hometown where I grew up and simplicity at its finest. And I loved it. It was literally a breath of fresh air! 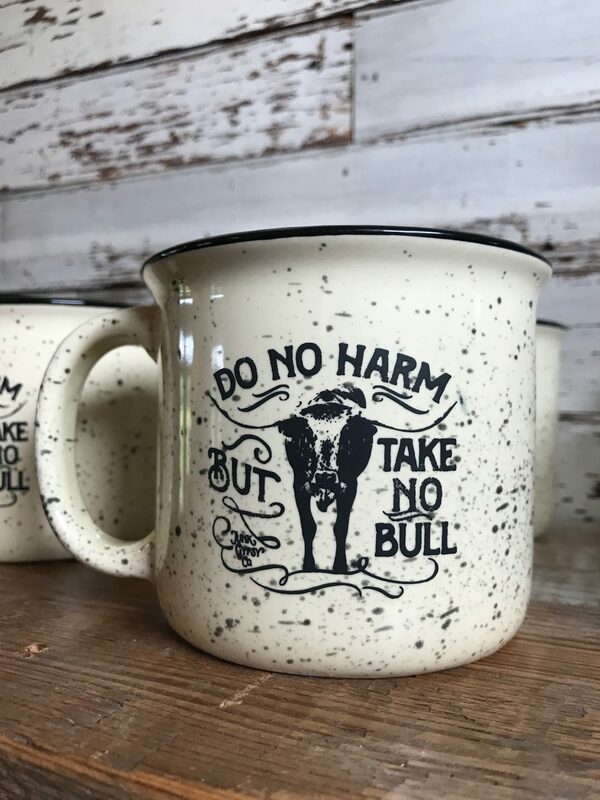 Let’s head to the front porch! There are Christmas lights wrapped on the porch from a Country Living magazine Christmas photoshoot that had just happened! Check out the gorgeous photos at Country Living! These girls designed everything in the Wander Inn. 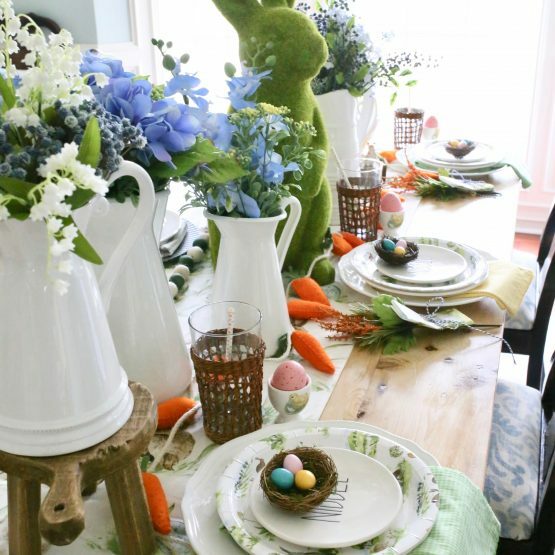 No assistants to design or decorate the space for them! 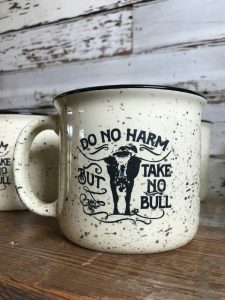 They are real ‘do it yourselfers.’ Stay long enough and you will hear stories of flea market finds that have been transformed into works of art, tables or lamps! The girls will tell you where they found it, how they made it, what inspired them, how long they have hoarded it knowing that one day, it will make an awesome display!!! 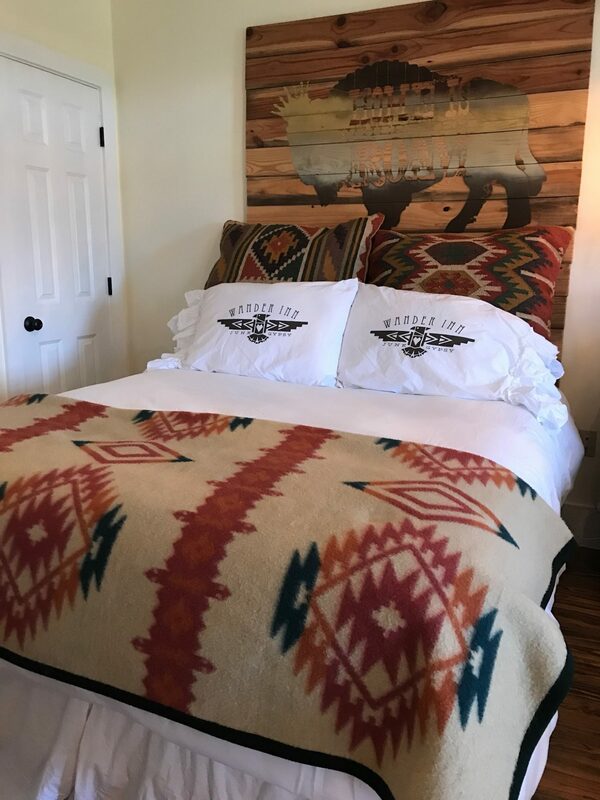 Yep, that was the story about a 20 foot plus USA flag that they held on for years until they used it for the Country Music Awards and now resides in one of the inn’s living spaces. Check out the upstairs living area of the room that we stayed in! 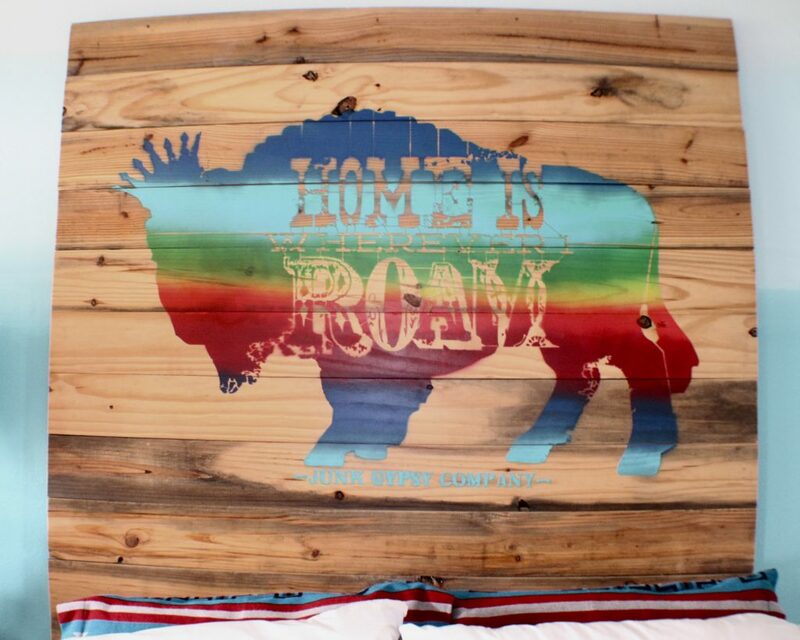 It perfectly reflects the Junk Gypsy style – part hippie, part rock star, lots of vintage and repurposed finds! I mean c’mon, look at the vintage velvet tufted navy blue couch! Retro goodness! I love the DIY coffee table made from an old drum and reclaimed chippy wood on top. 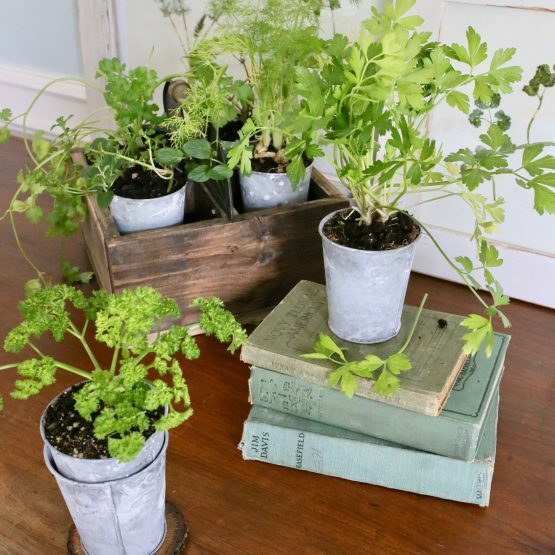 This reclaimed wood is gorgeous and perfect chippy, peely paint! I love the found letters! 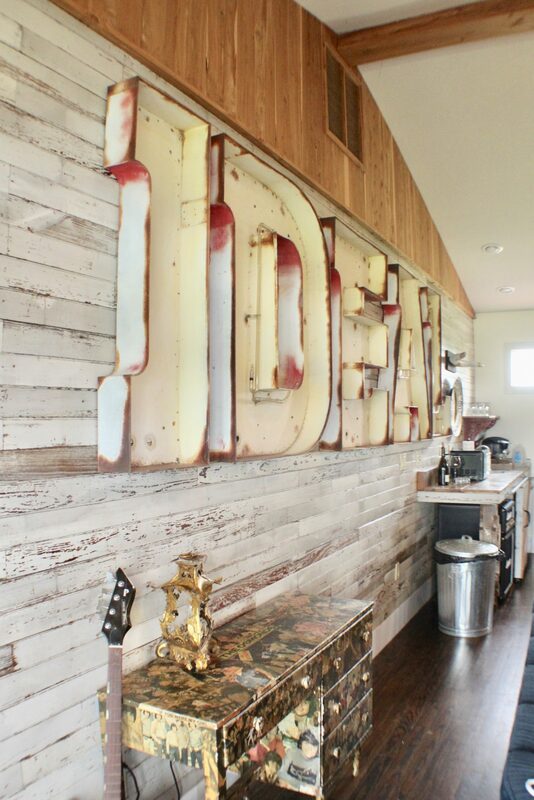 Again, with the gorgeous reclaimed wood and architectural pieces to create a one of a kind kitchenette! Check out the size of that corbel!! 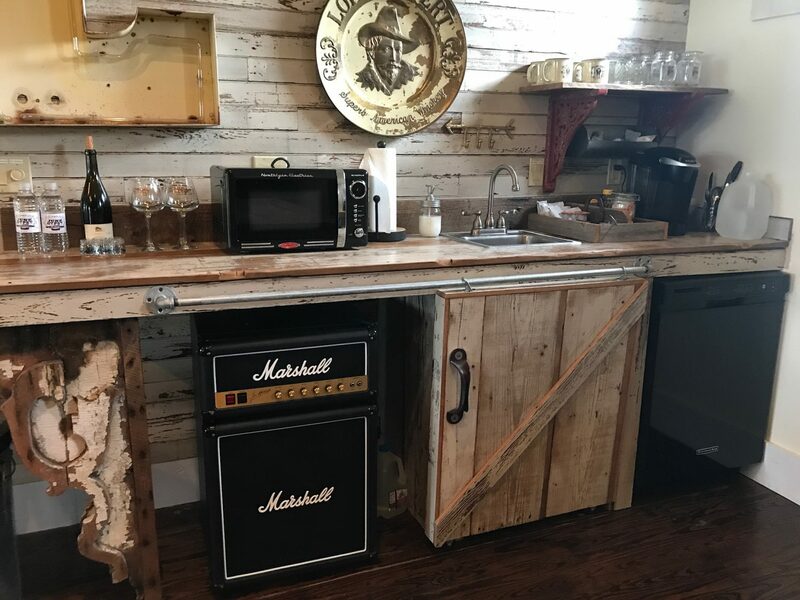 And an amp inspired mini fridge! The Wander Inn is full of JG original designs that can be purchased at their store like these ‘Do no Harm’ coffee mugs or ‘Honey Hush’ mason jars glasses. 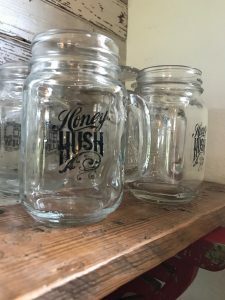 If you missed the tour of the Junk Gypsy Company store, check it out my previous post! Each of the two buildings house four bedrooms and one shared living space. 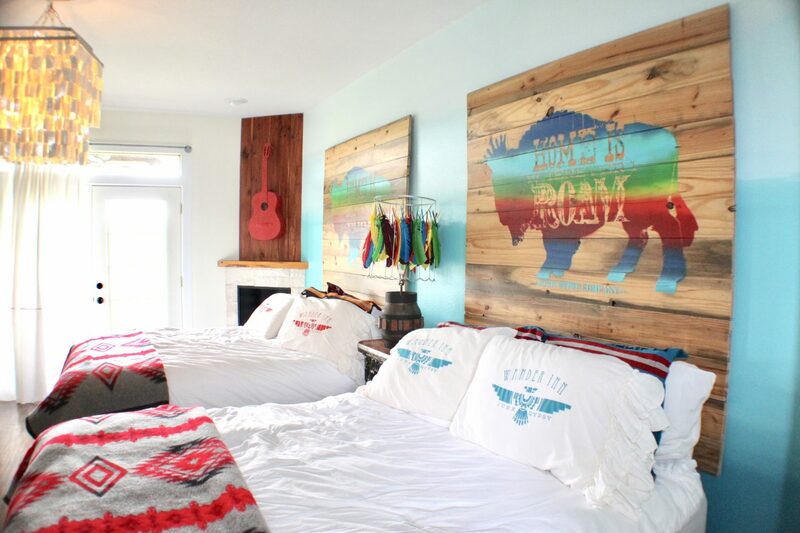 Here is one of the bohemian inspired bedrooms! I love the crisp white bedding with pops of color. Every room is decorated with a chandelier! 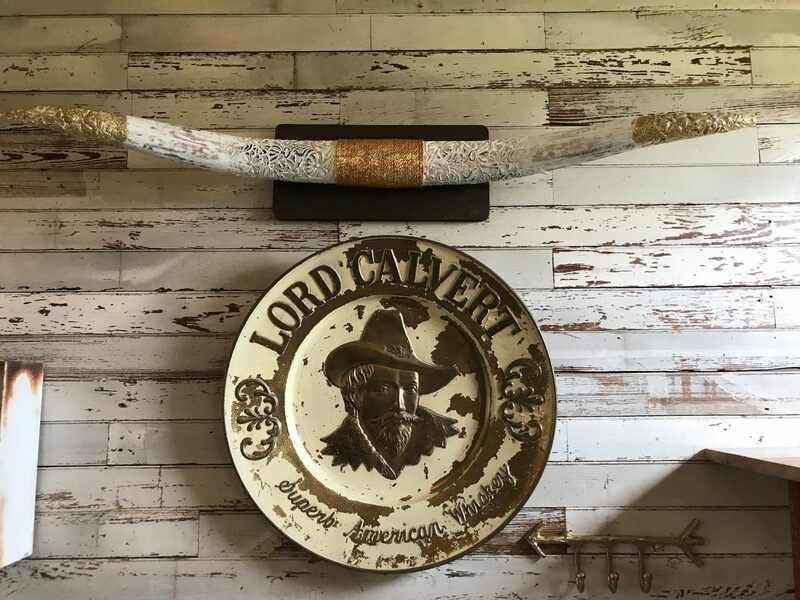 Some are vintage, some are new, some are handmade, but all of them add a fun, funky and glam element to the space. 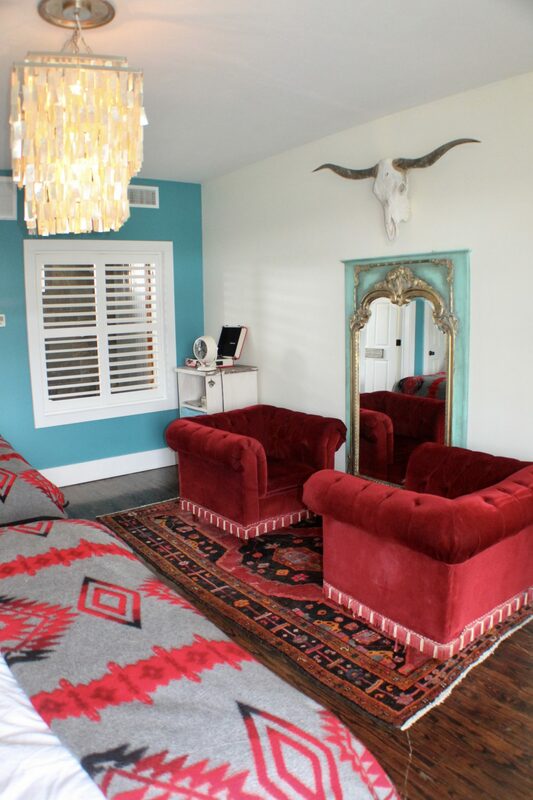 One of my favorite things about this room is the turquoise ombre accent wall. 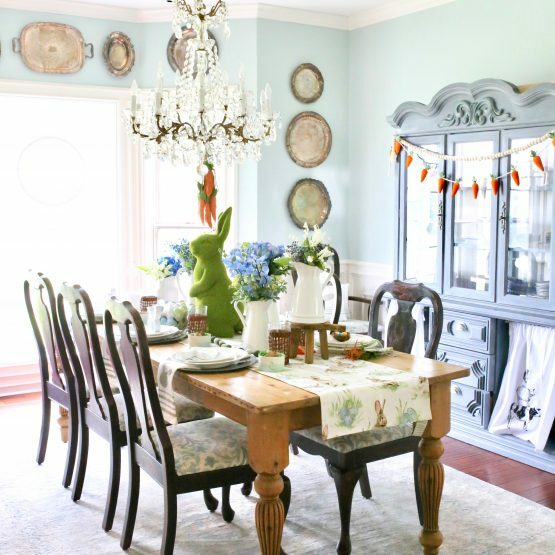 It is a beautiful yet gradual transition from dark to light blue! Amie and Jolie recently shared how to make a similar DIY lamp shade on their original Facebook video series. They have a warehouse full of roadside finds, chippy wood, and good ole junk waiting to be repurposed into something new. The gypsy spirit encourages us to live wild and free, follow your dreams, be creative and yet resourceful, but always, always, always be authentic to yourself! 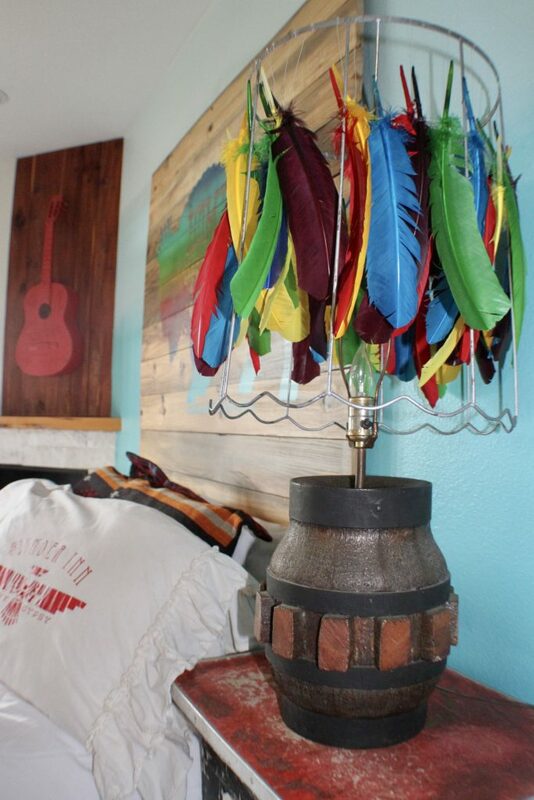 It is apparent that the Junk Gypsies love color and the red and turquoise combo! I adore Jolie’s turquoise cabinets and red chairs and red signs in her kitchen. It is in the book, y’all. 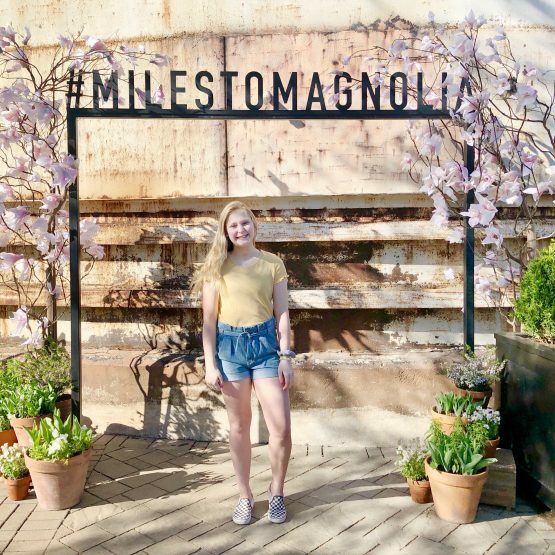 So is the sweet sixteen party that they decorated for Sadie Robertson (Duck Dynasty, y’all) and Miranda Lambert’s airstream. I can’t give out any more details, but get a copy! In the other bedroom, the girls went for a more neutral look! And I love it, too! 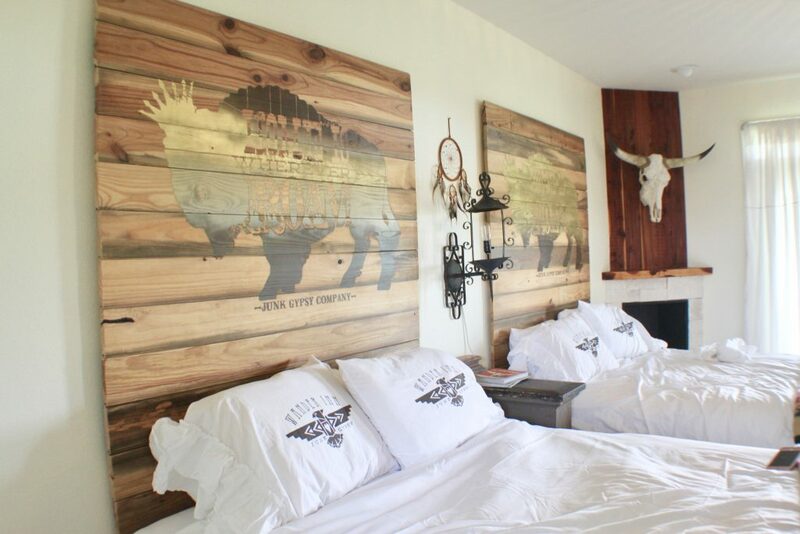 This headboard is so creative, and would be fairly easy to DIY into a style or artwork that works in your home. You don’t need a lot of money to make something unique, you just need a lot of junk…or old wood! And paint! Because paint transforms anything! 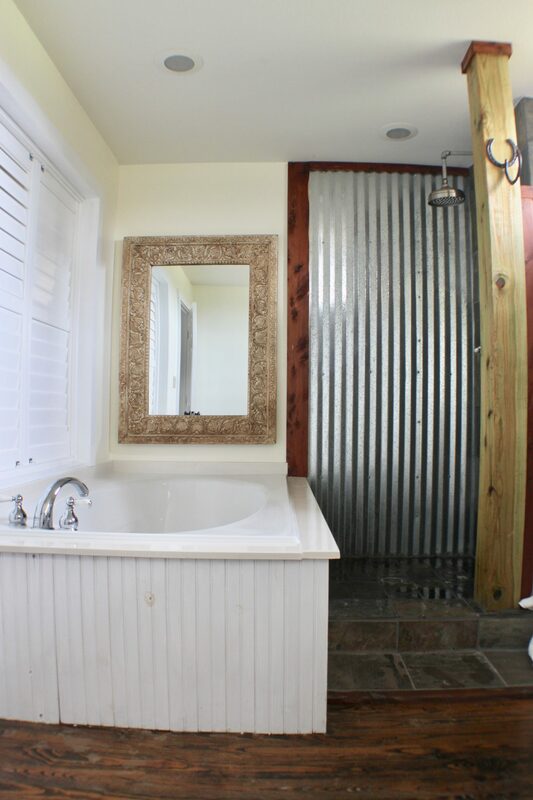 Here’s a sneak into the bathroom! Love the witty sign! It is all in the details, y’all! Reclaimed materials including galvanized tin and beadboard make up the tub and shower area. Even with a mix of materials, these girls always pull it off into one cohesive style! I love the wood countertop. I think it is made from cedar, which is pretty resourceful since there is a lot of cedar in Texas. It blends beautifully with the mix of wood and white. 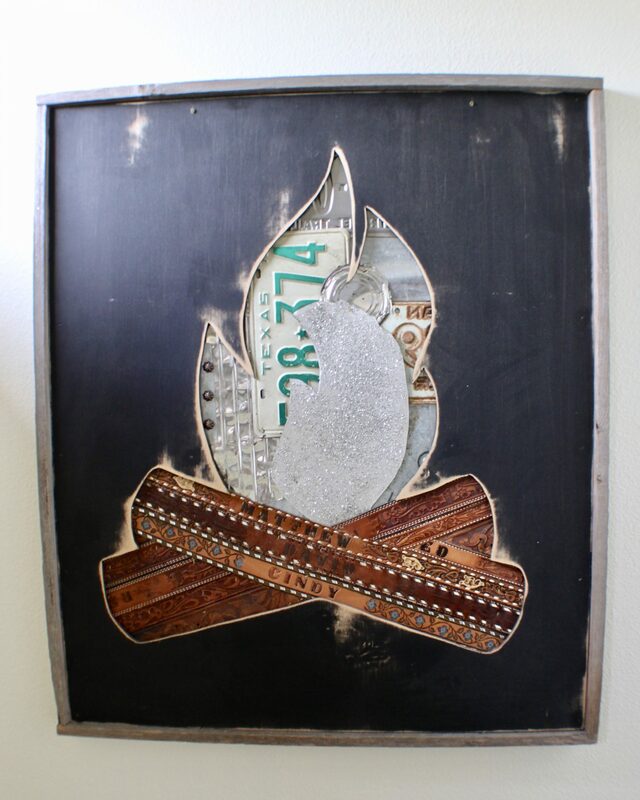 Amie used old license plates, western belts, tin cans and glitter to create this one of a kind art work, currently on display in the bathroom! You need something cool to look at when you sit! Speaking of not sitting, did anyone else who grew up in the South in the 1990’s get a whoopin’ with a leather belt and have the imprint of acorns left on your bottom? Me, either! I was asking for my sisters. 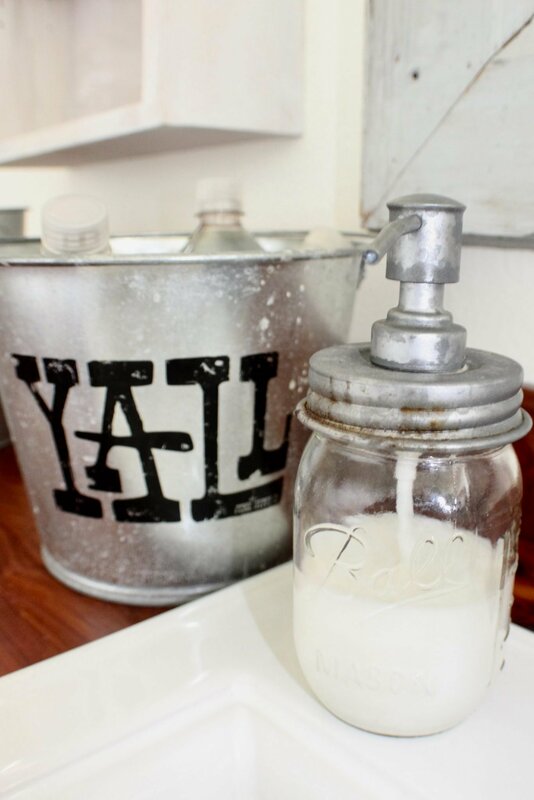 In the country and in Texas, we drink sweet tea out of mason jars but more recently, we also put our hand soap in mason jars! It is totally a thing! We met the hosts of Small Town, Big Deal, Jann Carl (Entertainment Tonight) and Rodney Miller, during the Virginia Dare wine tasting. You can check out more about their tv show here. These two travel across the US to showcase unique and historical small towns in rural America. They stayed in the neighboring building along with some designers from Pottery Barn who are working with the JG on a teen bedding line. We also met Jep Robertson, who has previously stayed with his family at the Wander Inn, and was serving up southern food in his food truck at the JG headquarters. 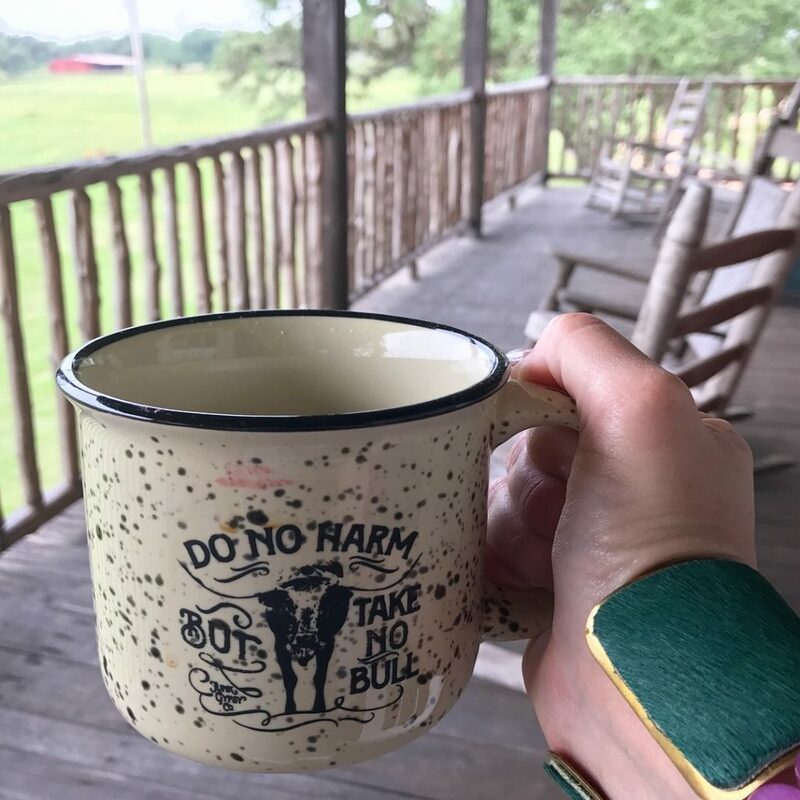 Now that you have seen everything from the front porch to the bathroom, and read about our fan girl moments, let me show you some of my Instagram buddies that traveled with me to the Wander Inn in Round Top, Texas. 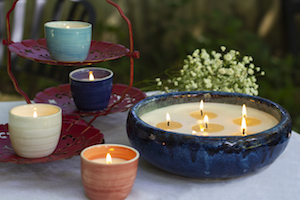 I am including their Instagram handle so you can find them over on Instagram sharing their beautiful homes. 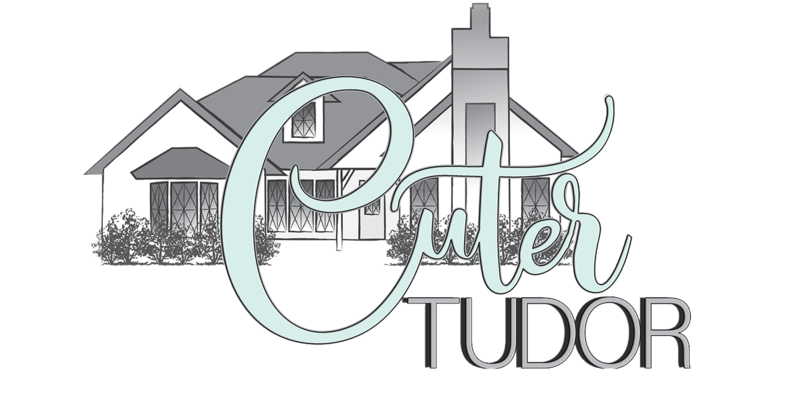 First up is my girl Cindy @acottagegirl who also has aqua blue cabinets to swoon over! There’s Jill @gatheredgrace who I met on Instagram to find out she is my sweet neighbor. The last pic is Audrey @farmhouseonelderhill who blogs at farmhouseonelderhill.com. Also, Stephanie @yellowfarmhouseadventures is a Southern sweetheart, but didn’t get a selfie with me! 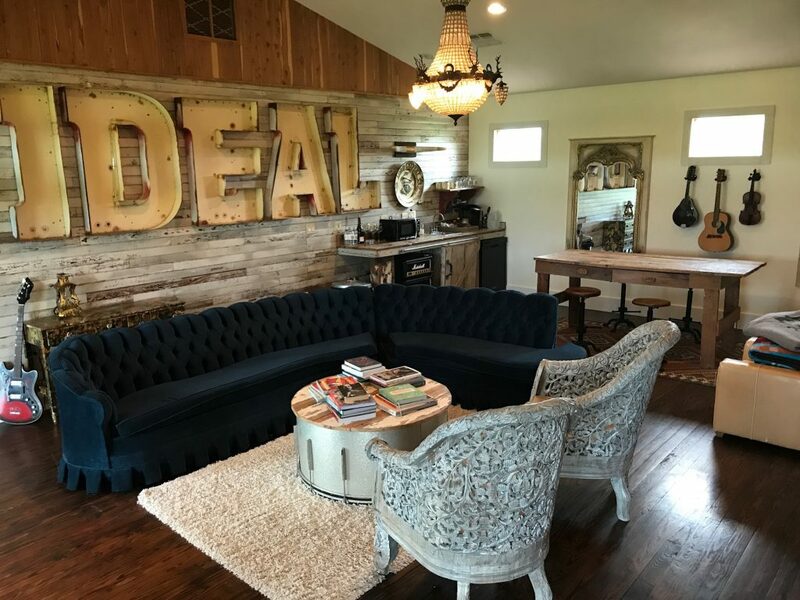 We had a great time wandering off in the fields of flea market finds in Warrenton, sipping wine around the fire pit at the Wander Inn, and road tripping from Austin to Waco!